Vidhi graduated from the University of Pittsburgh with a Master in Rehabilitation Science (Major – Musculoskeletal). She has a special interest in treating musculoskeletal and sports Injuries, pre-and post-operative cases, vestibular rehabilitation. Vidhi believes in the wonders that manual therapy does to restore lost function of the limbs and joints. She enjoys outpatient settings and believes in a holistic approach towards patient care with current evidence-based practice. 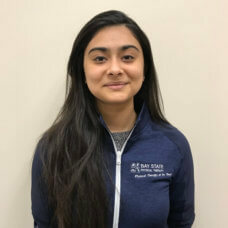 Vidhi has completed CEUs and certified courses in MSK and sports Taping, Myofascial trigger release, Neurodynamic solutions and keeps great interest in learning and continuing to enhance her knowledge towards better patient care. Vidhi enjoys dancing and traveling to new places in her leisure time. Coffee place readings are her best escape from a hectic day.